Fourteen weeks – 98 days – after Easter is the Feast of Transfiguration, Aylagerbutiun in Ar menian but popularly known as Vartavar. Though this is designated as a religious feast, we do not think of it in that sense alone. The Armenian people are unique in that they prefer to think of most feasts – like Transfiguration – as both a religious and a popular (or secular) feast, the two blended together. It is rare for Armenian feasts to be purely religious or purely secular. This miraculous episode taken in its literal sense is the following. When Jesus was considering going to Jerusalem after about three years of His ministry, He was preparing His disciples and foretelling the time of the torture that was awaiting Him and the end of His life on earth. In His discussions with them, Jesus was thereby also examining what the effect would be on His disciples, to make sure that they would interpret the events properly. It was in such discussions in the region of Caesarea Philippe when the disciples had become impatient with the Master’s premonitions. In their exasperation, Peter said, “God forbid, Lord! This shall never happen to You.” (Matt 16:22). Jesus admonished Peter and said, “Get behind me, Satan…” (Matt 16:23). Later, in the same circumstances, Jesus said, “If any man would come after me, let him deny himself and take up his cross and follow me…” (Matt 16:24). About a week after that discussion and exhortation, Jesus had His miraculous Transfiguration when He had gone up the Holy Mountain, Tabor, with three of His disciples for prayer. They were Simon Peter, James, and his brother John Zebedee. The other nine disciples, fatigued, had remained at the base of the mountain. In truth, the three who had accompanied Jesus were also tired. And when, as usual, Jesus began his nightly worship, they had begun to doze off into sleep. In that beautiful, natural environment Jesus, transformed, began to pray. At that moment a miraculous light illuminated His face; Jesus became transfigured. He took on an altogether different appearance. In that superb, dazzling revelation, the three dozing disciples, coming awake, raised their heads. Fascinated, they watched the unprecedentedly brilliant scene in which they saw Him in His glory. The moment was bewitching, enchanting, and most delightful. It was late in the night, yet there was light as from the sun. The disciples were bewildered. They did not know what to do or what to say. In that unprecedented vision they saw two other figures who were talking to the Teacher about the brief period of time left in His life to the time in Jerusalem where the supreme sacrifice was awaiting Him for the sake of the salvation of mankind. Those two figures seemed to be the Prophets Moses and Elijah. In the end the spokesman for the three disciples was once again Peter, who, for the sake of having said something, said, “Master, it is well that we are here; let us make three booths, one for You and one for Moses and one for Elijah.” (Luke 9:33). The miraculous scene was gradually reaching its conclusion. “As he said this, a cloud came and overshadowed them; and they were afraid as they entered the cloud.” (Luke 9:34). The voice of God was heard with the same declaration as on the first occasion when Jesus was being baptized in the River Jordan by the hand of John the Baptist. “This is my Son, my Chosen; listen to him!” (Luke 9:35). 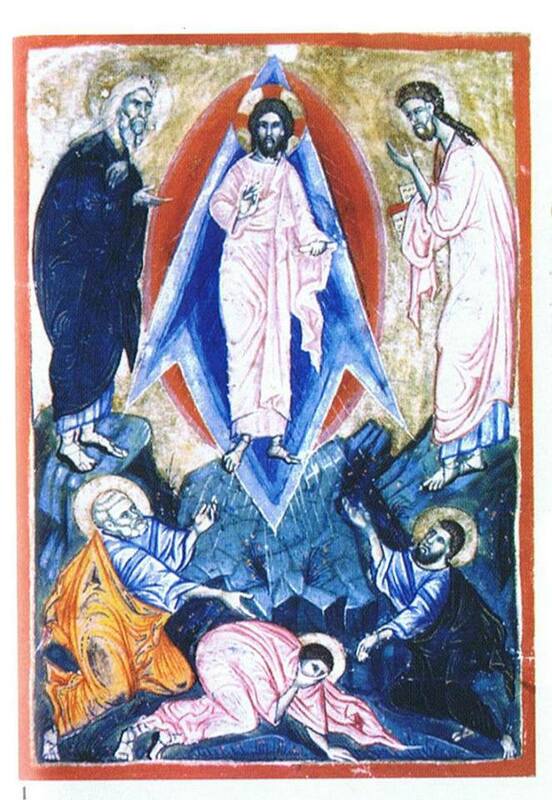 The event of the Transfiguration had reached its end. As in earlier significant episodes, this time again, Jesus cautioned His disciples to remain quiet and not speak of the happening until the close of His life on earth, until His Resurrection from the dead. (Mark 9:9-10). The Greek Orthodox and Roman Catholic Churches traditionally observe the Transfiguration on August 6. The event took place when Jesus was already 33 years old, in our calendar on August 6 of the year 29, assuming that He foretold of the last days of His life on July 30. 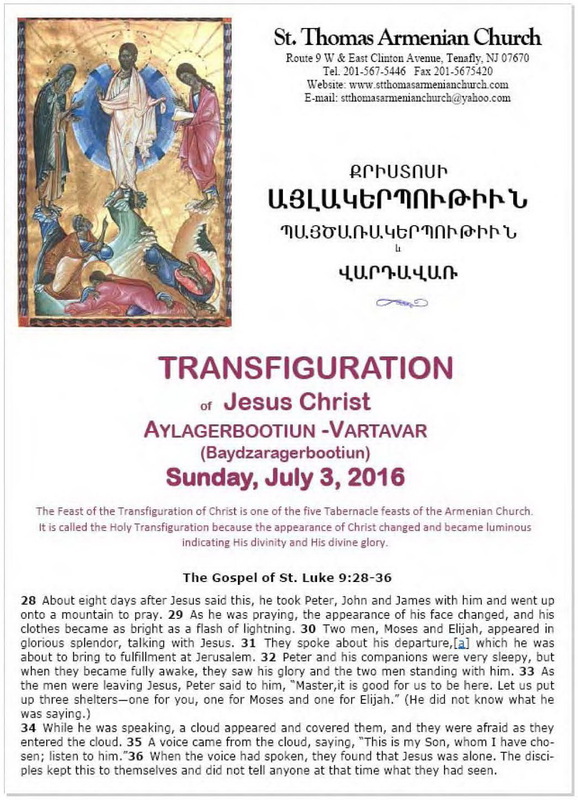 In contrast to the Greek and Latin churches, the Armenian Church has connected the Transfiguration to the beginning of the year of the ancient Armenian calendar, to Navasart, which came according to the present calendar of August 11. It is well known that for Armenians, Navasart was an occasion for great popular activity, enthusiastic cultural and athletic competitions. Our people enjoyed and reveled in that custom for centuries. The closing ceremonies of the celebration took place in Artashat, near the lnnaknian Mehean (pagan temple) – later St. Garabed Monastery of Mush – where the principle idols of the heathen faith of the Armenians were placed. St. Gregory the Enlightener recognized that it would be difficult for the people to discard their customs of centuries standing, so he joined the observance of the Transfiguration with the Feast of Navasart. The religious ceremonies and their purposes take on a different meaning when athletic contests, popular games, and cultural competition continue to be a part of the observation, and therefore associated with them. Such observation continued for about 250 years, when in the year 552 (which was taken to be year “1” – a difference of 551 years) a new Armenian calendar was adopted. At that time it was considered appropriate to join the Feast of the Transfiguration to the dominical sequence of feasts, making it movable over a period of 35 days together with Easter. As a movable feast, Transfiguration was placed in the dominical sequence – of course, not a matter of doctrine – for the following very important considerations. It was recognized also that each was preceded by a week of abstinence, and each was followed with a Memorial Day the next day. 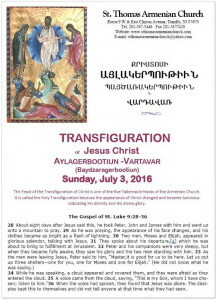 We had mentioned that St. Gregory the Enlightener had combined the observance of Transfiguration with the Armenian feast of New Year, Navasart, in August. The time shift for the observance of Transfiguration after the introduction of the new Armenian calendar made it match the observance of the feast of Asdghig, one of the most popular goddesses of the ancient Armenian heathen religious, and associated with it came the continuation of the heathen customs. Asdghig was the goddess of love and beauty. She corresponds to the Greek Aphrodite. Her principal temples were in Ashtishat, in the Artamet region of Van, and elsewhere. The festivities associated with the religious observance of her person was called Vartavar, and the traditional ceremonies were conducted in mid-June. Asdghig was not only the goddess of love and beauty, but also of water. The prayers and beseeching directed to her asked for water for the benefit of fields, fruit orchards, and vineyards under cultivation. Ceremonies of thanksgiving and pageants were conducted everywhere, on the banks of streams and at springs. Animals were sacrificed as part of the ceremonies. Vartavar occurred at harvest time. It was looked upon as an expression of gratitude and thanksgiving in return for the goodness of the harvest. The same custom, this splendid practice of man’s expressing gratitude, was encouraged and made part of the new religion, by the Armenian Church itself. The people continued to express those noble feelings through the new religion, making gifts of ears of corn, flowers, and bouquets of roses to the church and to one another. There was a custom during this feast also of releasing pigeons and engaging in water games. Bouquets of roses were tied to the foreheads of animals used in farming activities. Such customs are still being practiced today, to some extent. Our being broadly dispersed as a people makes it very difficult, of course, to carry on those customs fully. In their place, however, under the new patterns of our lives, the celebrations of these feasts take place in somewhat different ways. We hold large gatherings in verdant fields having bodies of water, picnics, outings, and in doing so we are recalling the past and preserving the tradition. The feast of Vartavar, apart from its religious observance, provides the times for joyful festivities within family gatherings. Many names bring on the occasion for congratulation directed to their owners. Such names are Vartkes, Vartavar, Vart, Patrig, Alvart, Zarvart, Lousvart, Nevart, Baidzar, Vartanoush, Vartiter, Varvare, and others. When did they arise, and where? The traditions described below may shed some light on and explain the nature and source of our traditions connected with Vartavar – water games, releasing pigeons and others. “When the Deluge had ended and Patriarch Noah descended from the top of Masis into the land of “Nakhichevan” (first abode), he advised his sons to sprinkle water on one another so that man would remember the meaning of the Deluge.” (Azkabadoum). It is said that during the festivities of Vartavar, children, elderly, men, and women alike pour pitchers of water on one another in the homes, on the streets, in the fields, on the banks of rivers, near springs and streams; they even dunk one another in the waters. This practice has come down to us in Armenia, from the time of Noah. It is believed that the custom of releasing pigeons also comes from Noah’s releasing a dove to determine if the waters of the Deluge had all subsided, based on the Biblical account of the Deluge. They say that the Transfiguration may have occurred on one of the peaks of the Hermon mountains of the anti-Libanus range. This position is taken because when Jesus revealed in Caesarea Philippi that He would shortly be arrested and crucified, and if a week later He was transfigured on Mt. Tabor, the interval of time is too short for travelling that distance. But those who defend the traditional site argue that the distance can be covered comfortably in three to four days. Mt. Tabor must be considered more likely to be the correct site because of the tradition that has remained from the very first centuries. In any case there is no doctrinal issue here, only an interesting philological one. PROPHET MOSES: Leader of the Jewish people, approximately 13th century B.C. The greatest of the prophets, who during his infancy should have drowned, but was secretly rescued by the Pharaoh’s sister. As an adult he became the savior of the Jewish people. On Mt. Sinai, on the way from Egypt to Palestine, he obtained the Ten Commandments from God. He is regarded as a prophet by both Christians and Muslims. The Prophet Moses is regarded to be the author of the Pentateuch (the first five books of the Old Testament), but which were actually written later, between the 9th and 7th centuries B.C. PROPHET ELIJAH: One of the greatest and most popular figures of the Bible. The name literally means “My God is Jehovah.” He not only performed miracles, but he also did not die; he was lifted into the heavens (876 B.C.) (2 Kings 2:11). His prophecies of the Old Testament are in his name.